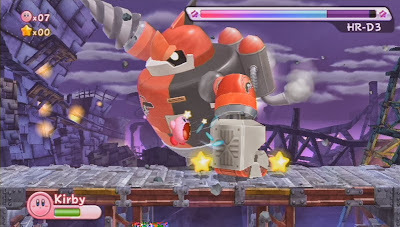 The Kirby series has its share of experimental spin-off games so it seems like the main entries with platforming and enemy ability stealing sometimes get lost in the mix. Well in this case, with a title like Kirby's Return to Dreamland, there's no doubt that this game takes Kirby back to those things that made him famous in the first place. The result of that is a game that stands among Nintendo's best and gives New Super Mario Bros. and Donkey Kong Country Returns a run for their money. 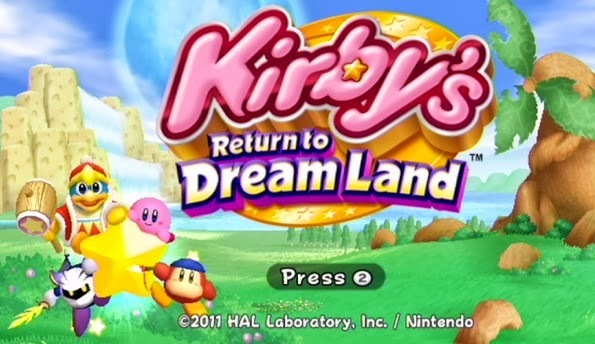 Return to Dreamland takes everything the previous Kirby games did right and brings it together for great effect. 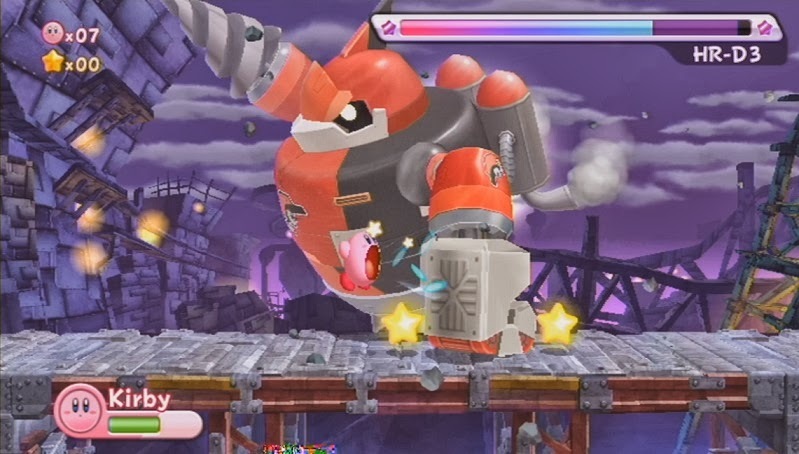 It has the usual eating of enemies and copying of abilities that we've known and loved since Kirby's Adventure and Kirby's Dream Land. It's got simultaneous multiplayer like Kirby Super Star and Kirby's Dream Land 3, but better. It has a variety of attacks for each ability, also from Kirby Super Star. And it also has a variety of modes to play as well. Each new area is a treat to look at. The main mode of Return to Dreamland takes you through a series of seven-ish worlds (the eighth world is just bosses) with four to five levels each. They're pretty standard for what you'd expect from a Kirby game, and that's a good thing. They're well designed from a gameplay perspective, have fantastic music that's a mix of old and new, and are so visually spectacular you'll want to steal screenshots for your desktop wallpaper. New types of enemies are gradually introduced, giving you time to master each new ability as it becomes available and making each new discovery fun and exciting. Each ability controls intuitively and with the precision you'd expect from a game by HAL Laboratory, but move lists for your current ability are also listed on the pause screen in case you need them. Each level also contains three to five collectible gears which unlock challenge stages, minigames, and practice rooms for each ability. These gears are sometimes hidden in plain sight, but usually require a specific ability and some clever thinking to get to. Some levels also have segments where you get a super ability, which allows you to totally and spectacularly demolish everything in your path. In each of these segments, there is also a hidden portal to an optional, more challenging, area in which you have to outrun an ever-approaching void and defeat a miniboss for more gears. Along with the super abilities, another new addition are the items which can be carried or ridden (in case of the giant spiky boot) for various effects. Hidden portals bring you to optional, more difficult, areas like this. 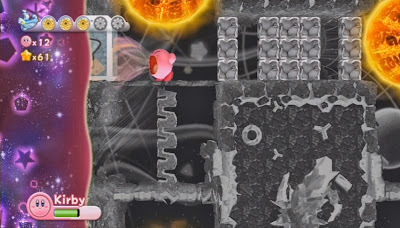 Those who have played past Kirby games may fear that this latest entry will be over too quickly like some of the previous games. Fortunately, the levels in Return to Dreamland are quite long, often taking around ten minutes each to complete. On top of that are seven challenge rooms which are cleverly designed around particular abilities and force you to race through for high scores. Then there are two minigames (also multiplayer like the main game) that are more fun than you'd expect and involve throwing ninja stars at targets and blowing up mechs. Boss Rush mode also makes a return in The Arena. But the biggest source of replayability comes with Extra Mode, a harder version of the game that is unlocked after completing the game on normal. In Extra Mode, you'll have to go through again with half health, stronger and more plentiful enemies, and harder, and entirely new, bosses with new attacks. Even experienced gamers will find this mode to be challenging at points. Extra Mode even has its own harder versions of the challenge stages too. It's not just less health and more damage, it's hard mode done right, and it's different enough to be worth playing. This epic boss is only seen in Extra Mode. There's too much to show in just a few screenshots; check out my full playthrough of Extra mode over here. For yet another way to play through the game, there's simultaneous multiplayer with up to four players. 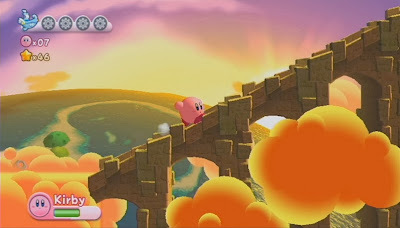 Each player can play as either a different colored Kirby, Dedede, Meta Knight, or Waddle Dee, but the three non-Kirby characters are essentially just the same as one of Kirby's abilities (Hammer, Sword, and Spear). Lives are shared and fallen teammates will continue to respawn as long as you have lives to spare. However, if Player 1 dies, you have to start the room over. Having four players on-screen at a time can be chaotic, but it's still very fun and strategic cooperation is possible. You could say that Return to Dreamland is just more of the same, but it's more of the same done incredibly well. 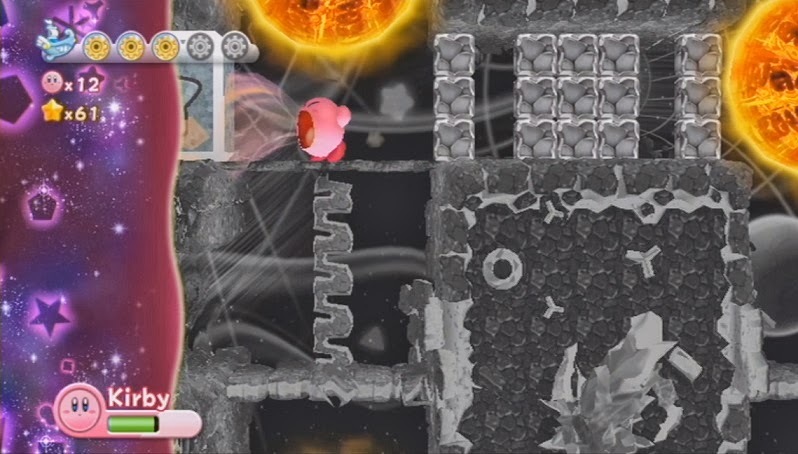 Everything great about Kirby games is brought together in this one game. I know that it came out near the end of the Wii's life and that its price has hardly dropped below $50 since its release, but Return to Dreamland is arguably the best Kirby game to date and you owe it to yourself to play it. Should You Go Digital? Probably Not.